Sydney-based digital artist Yiying Lu has unveiled her latest creation that uses augmented reality (AR) to uncover an underworld of interactivity on walls. Lu is Co-Founder & Creative Director of Walls 360, a company that creates on-demand custom wall graphics of Lu’s digital designs. People can order the artwork online and stick them on their walls at home or in the office. Working with buildAR, the AR content creation platform, and the recently launched Layar Vision application, Lu is striving to make interactive art available everywhere. 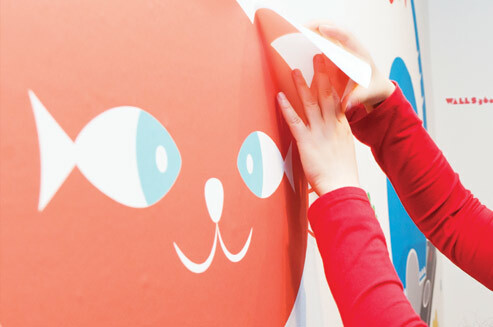 By pointing your smartphone or tablet at their wall art, users can unearth new messages and peel away layers to expose new content that can be updated at any time. The artwork will come with pre-defined AR content, but users will also be able to add their own content, meaning it could be good for quirky gifts that are personalized for the recipient. There will be a Web-based interface for adding these messages and content. Only some pieces will be AR enabled, and this will be clearly represented on the site. If you’re not up for the challenge, they have also created a robot QR code. When you receive your wall art, this will include a smaller QR code sticker that you can choose to place on the wall so people know the wall art is interactive. You can find out more about the new interactive AR art by visiting: http://app.walls360.com. The default AR content that the pieces will have includes a game called ‘Fishy Kitty’, but more will be rolled out over time. These games use vision-based recognition to launch the game and then location-based AR to spread the markers (e.g. the gold fish bowls in the game) around you. “We love working with Yiying and the beautiful artwork she creates. Together we’ve created a whole new retail model for augmented reality by enabling people to attach their own hidden messages, 3d objects and other content to the amazing WALLS 360 wall art. Now, putting one of these artworks on your wall is just thebeginning. They create a digital doorway through which new and exciting creations will leaping out at you”. The public release of the Layar Vision enabled browser is in October, so until then the good people behind this initiative can only demonstrate what they have developed as per the video above. Meanwhile, if you want to read more about augmented reality, check out: Augmented Reality: Past, Present and Future.